What do you do when someone who has owned the same region for over a decade, asks for the dream environment they’ve been searching for, for all those years? Get intimidated? Laugh nervously? I think we did both of those things at first. I think all of us knew the next few months would be pretty intense, but perhaps not quite to the extent that it has been. We were asked to create an Indonesian surf break unlike any other in SL, given some Pinterest images as a guide, then given complete free reign. I wont lie, the first week of planning and idea collection was a challenge, as was trying to find a way to balance explorable land, a couple of sporadic rentals and maximum wave space. 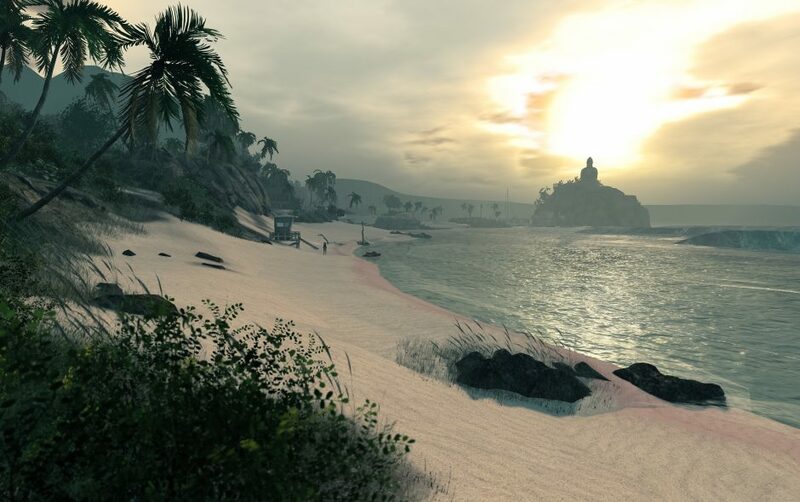 Tropical beaches in SL are literally everywhere, almost every sim you land on. Tropical surf regions are even more common. So we decided to try a few ideas and techniques we’d never seen before; a massively-expansive coastline, pink-kissed sands, immersive jungle canopy and iconic Indo-Asian ethnicity, to try and inspire a sense of a complete world, not just another four-walled region. Along the way there has been tears, pain, awe and not least of all an army of Linden employees trying to fix the restrictions we found in SL while trying to build this new world. The result is a dynamic, immersive, inspirational and relaxing environment that we like to think is unique.